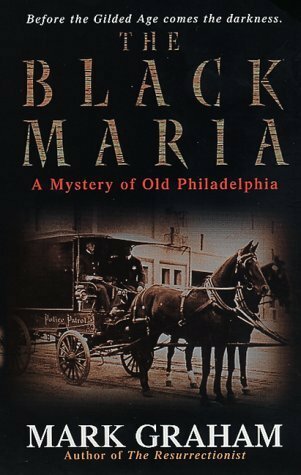 The Black Maria follows Philadelphia Police Detective Wilton McCleary as he exposes the seedy underbelly of the Centennial Exposition, in a gripping search to find a savage murderer. Page-turning suspense drives the plot, while carefully-researched details of late 19th Century Philadelphia life and times draw readers into the gaslight noir of McCleary’s world. Author Mark Graham’s attention to period detail has never been better, nor more fully-realized, than it is here. Readers will find themselves so caught-up in the sights, sounds, smells and excitement of the Centennial Exposition that, after they turn the last page, they’ll have a hard time believing they didn’t just travel back in time. so far this is a dull description of philadelphia's centennial fair of 1876. i wouldn't have picked it up if it hadn't have been a group discussion read and i hope the storyline gets a bit more engaging and less sedentary soon. I can't bring myself to pick this book up again to finish it. I'm just bored with the whole thing, characters, plot, even the scenery, which is probably the best bit, is boring me. I don't care what happened at all. I'm not even intruigued enough to look through other peoples posts in the group discussion to find out what happened in the end of the book. This book won the 2001 Edgar Award for the Best Paperback Original. I'd expect an award winner to be a well rounded book in terms of writing, characters, plot and setting and to excel in at least one of those categories. I don't mind that a book I don't personally enjoy can win awards but I can't see anything in this book to make it award worthy. I seem to be reading Mark Graham's series about old Philadelphia backwards. The Black Maria is an excellent book that tells the story of Wilton McCleary during the time of the Centennial Exhibition. McCleary is working on the grounds of the Exhibition as a patrolman. He finds the body of a girl. In this book, hampered by police contemptuous of him for failing to get the kidnappers of a small boy, he works hard to find the murderer. He also faces the consequences of siding with the ordinary person sometimes rather than the rich and powerful. Graham very carefully sets us in the atmosphere of this time period. I read this book mostly because I'm a completist (plus I had already scored a copy on Paperback Swap before I got the unrelentingly bleak second book in the series, The Resurrectionist). I had a hard time getting started, mostly because I knew it was going to be a long revisit to a dark, dirty, unfair, and corrupt world. But I was so absorbed in the book that I nearly missed my bus, so I guess I did get into it. Have your neck brace ready, because the final 50 or so pages are an exercise in whiplash. I didn't finish this book. Too slow for me, not much of a plot as far as I was concerned. I think Mark Graham paints a good picture of Philadelphia in 1876 and the atmosphere of the World Expo that year. His characters are believable. I will definitely read more books by Mark Graham. Couldn't resist adding this one. Which I've heard is an excellent, excellent mystery. Not that I'm prejudiced in any way. Mark Graham - Mark Graham is the Edgar award-winning author of "Black Maria", third in a series of historical novels which have been translated into several languages. He studied medieval history and religious studies at Connecticut College and has a master's degree in English literature from Kutztown University. He lives in the Lehigh Valley, Pennsylvania.